The Hillsboro boys Track and Field team is pictured with their second place trophy from the Chillicothe Fairweather Relays at Chillicothe High School on Saturday, March 23. 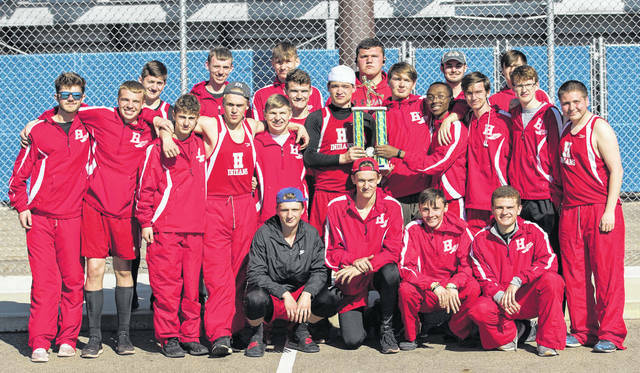 The Hillsboro boys and girls varsity Track and Field teams traveled to Chillicothe on Saturday, March 20, and competed in the Chillicothe Fairweather Relays where the boys team took home second place in the team standing and the girls finished in fourth place. The Chillicothe Fairweather Relays was the first event of the year for both teams and was held at the home of Indians Frontier Athletic Conference rival the Chillicothe Cavaliers. The Unioto Shermans took first place in the boys team standings while Groveport-Madison was the top team in the girls competition. FAC representative and meet host Chillicothe was third in the boys standings and fifth in the girls standings. Kelsey Burns, Kenzie Dietrick and Kailey Dietrick finished in fourth place in the girls shot put relay with a combined distance of 58-08.50 and combined to finish in third place in the girls discus relay with a combined distance of 163-10. Eden Edenfield and Cierra Lively took home second place in the girls pole vault relay with a combined height of 14-00.00. Sydney Callahan and Riley Barton combined to finish in fourth place in the girls long jump relay with a total distance of 26-10. Lively and Lucy Hart competed in the girls high jump relay and finished in fifth place with a combined height of 8-08. The girls 800-meter sprint relay team of Edenfield, Karnes, Callahan and Hart finished in fourth place with a time of 2:05.1. Hailey Boone was second in the girls open 800-meter run and finished in a time of 3:05.2. Deon Burns and Draven Stodgel finished one and two in the individual shot put standings with throws of 49-05.50 and 46-08 respectively and took home first place in the boys shot put relay with a combined distance of 96-01.50. Burns and Stodgel also finished one two in the individual discus throw standings with distances of 128-09 and 126-10 respectively and took home fist place in the boys discus throw relay with a combined distance of 255-07. The girls 4×800-meter relay team of Blair, Schurman, McCreary and Hart took fourth place with a time of 11:16.7. Ryan Gundlefinger and Reed Harsha combined to finish in fifth place in the boys pole vault relay with a total height of 18-00. Anthony Richards and Keith Doughman were fourth and eighth in the individual long jump standing with distances of 18-01.75 and 17-04 respectively and combined to finish in third place in the boys long jump relay. Quinn Conlon was tied for third in the boys high jump standings with a height of 5-06 and combined with Landon Weber to finish in a tie for third in the boys high jump relay with a total height of 10-08. The boys 4×200 meter relay team of Workman, Richards, Doughman and Rickman took third place with a time of 1:38.2. The boys 4×400-meter realy team of Workman, Gallimore, Doughman and Alexander took fourth place with a time of 3:49.1. The boys shuttle hurdle relay team of Doughman, Alexander, Watson and Conlon won first place with a time of 1:06.6.